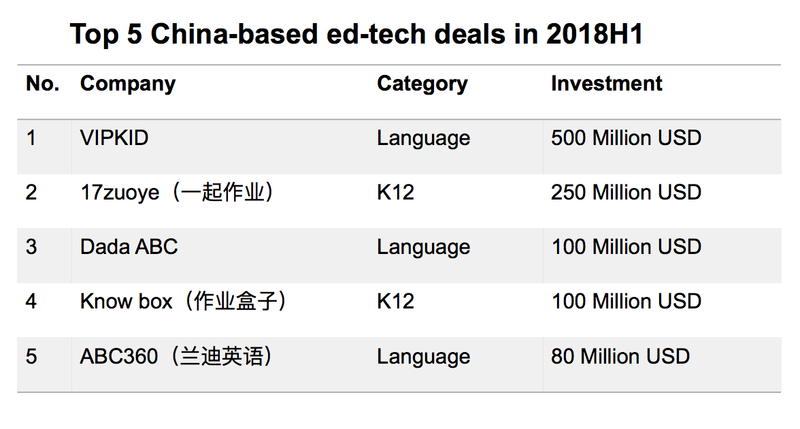 China-based ed-tech ventures in the first half of 2018 raised 2.22 Billion USD with 270 deals. 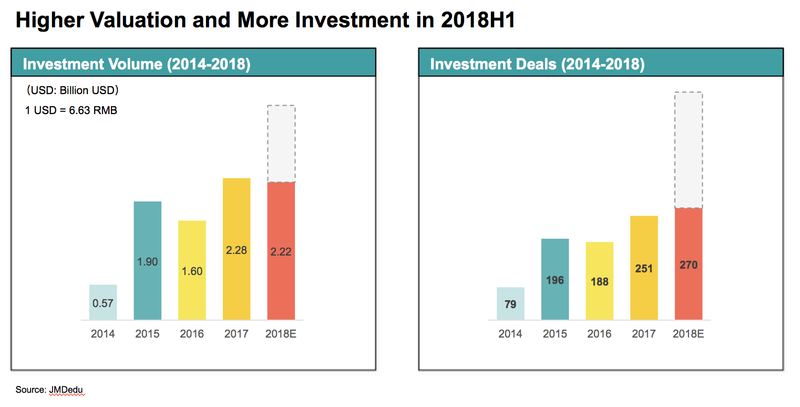 With only half year past in 2018, the total volume raised from venture capital is almost the volume of the whole year of 2017, which is 2.28 Billion USD and the number of deals has already exceeded the number of last year, which is 251. 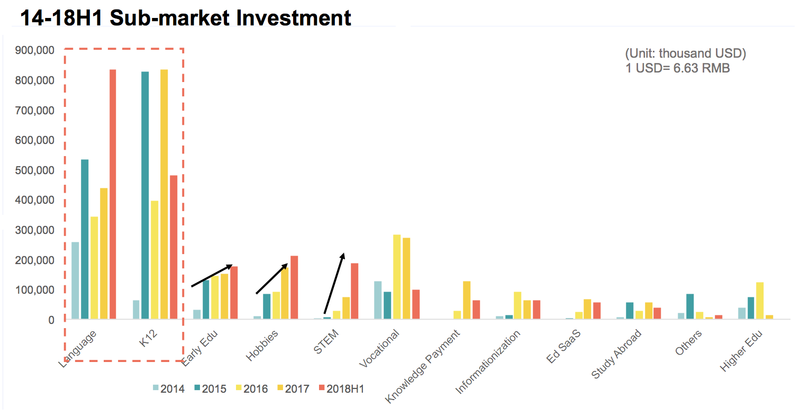 Breaking down the investment volume by sub-markets, we can see language learning and K12 raised the most money with 838 Million USD (5.53 Billion RMB) and 482 Million USD (3.18 Billion RMB) respectively. A handful of outsized rounds account for a substantial percentage for these two sub-markets. The top 5 deals in the first half of 2018 are either K12 online homework platform or online language learning with native English-speaking teachers. If we look at the number of investment deals, vocational, STEM, hobbies are the top 3 sub-markets. 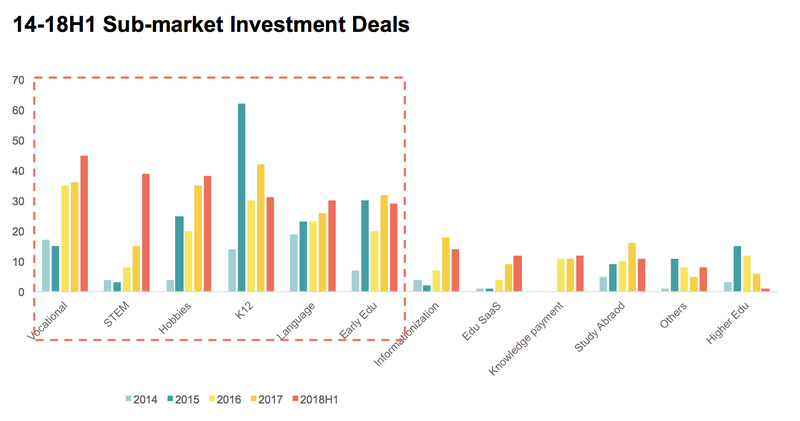 For STEM, the number of deals in 2018H1 is 2.6 times the number of deals compared with the whole year of 2017. We explained the drivers behind the fast growth of STEM education and the challenges and opportunities for entrepreneurs in our previous piece. Apart from STEM, parents are spending money even more early on, as a Chinese saying goes “Don’t lose at the starting point”. Online English learning startups/programs targeting kids aged 0–6 raised much attention with skyrocketing user growth. And it is not only English, parents are looking for learning content and programs that expose babies and toddlers to the mathematics, science, and music world, etc. If you have anything you would love to know about China education market, feel free to reach me at sophie.chen@jmdedu.com. And stay tuned for our next piece on the M&A and IPO summary of China Education in 2018H1.